KALEDON will release their 9th studio album "Antillius: The King Of The Light" through Scarlet Records on November 18th 2014. One and a half year after the release of the much celebrated "Altor: The King's Blacksmith", KALEDON is back with their new album. It's a concept album contains 12 songs and is another powerful and symphonic masterpiece which confirms them as one of the leading forces in Power/Epic metal today. 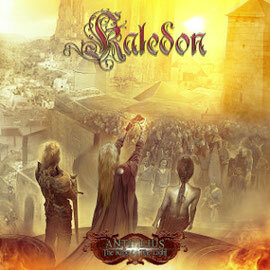 'Antillius' narrates the life of the King of Kaledon, one of the characters that the band introduced with their previous "Legend Of The Forgotten Reign" saga. The album was produced by Giuseppe Orlando (Novembre) at Outer Sound Studios in Rome, Italy. KALEDON has also teamed up with renowned artist Felipe Machado Franco (Blind Guardian, Rage, Rhapsody Of Fire, Iron Savior) for the beautiful cover artwork.